Tasting Notes: This is the 4th Edition of this wine. Each Edition is a unique blend of the most interesting and highest quality grapes from a vintage. Our goal with Cachet is to create a unique blend that will not be repeated, much like an artist's painting. Edition No. 4 shows a nose of smoke, spice, violets, dark blackberries, black cherry and plum. The same elements follow through onto the palate, along with earth, smoke, cranberry, savoury and floral notes. It finishes with a young but fine tannin structure. Winemaking: Hand picked, and hand sorted lots of Petite Verdot from Plut Vineyard, Osoyoos, and Merlot / Cabernet Sauvignon from rows 1-4 in our Stags Hollow Estate Vnyd. All lots were destemmed and 50% of the fruit was left uncrushed as whole berry. All lots were fermented in small 1 ton open topped fermenters. All ferments were inoculated with selected isolated yeast strains. The ferments were punched down 4-6 times daily by hand and after 18 days of skin contact, were pressed directly into 300 L Hogshead French oak barrels (of which 60% were new, 40% second fill). At the completion of malolactic fermentation in barrel, the wine was aged 'sur lie' for an additional 6 months before being racked, blended and returned to barrel for another 9 months of maturation. During the early summer of 2015, the wines were racked once again before being bottled without fining or filtration. Aging Potential: This wine will age gracefully over the next 10 years. TASTED: 06 JANUARY 2016 – TASTED BY: ANTHONY GISMONDI AND STUART TOBE. 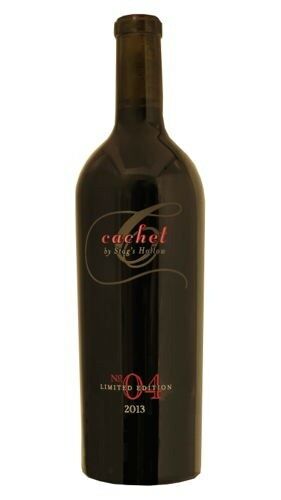 Cachet is made with the best fruit each year regardless of variety, in this case it is a 57/37/6 petit verdot, merlot and cabernet sauvignon blend. Look for black cherry, earthy, mushroom, tobacco, cranberry, smoky, peppery aromas with a light floral, plum note. Full, round, juicy, somewhat chunky palate with some young tannins but with fine concentration. Peppery, smoky, wet tobacco, savoury, cranberry, black cherry, vanilla, coffee flavours with a hint of tar, licorice and sage with some tea and herb on the finish. Should improve over the next 2-5 years. Excellent effort here.